Ladies and gentlemen, your response to our last post was incredible, so we've decided to finish up our review of Action Comics #312. Are you not familiar with this series? Fear not because you can catch up with our on-going review of Action Comics #312 by reading part one , part two, and part three of our review. Please click on each image to view! Kav: Stupidman explains it was all a 'hoax'. Aliens are coming with a bomb and they will demonstrate their power by freezing the ocean, destroying a model city etc. In order to stop a 'global panic' Stupes just told the world instead that HE IS NOW AN EVIL A SUPER POWERED BEING WHO CAN DEMOLISH THE PLANET WHILE PICKING HIS TEETH!!!!!!!!!!!! Yeah, dumbass-that didn't panic anyone. Tony: This was some lame backpedaling by the writer of this comic book. This might be worse than the Dallas episode where it was all a dream. 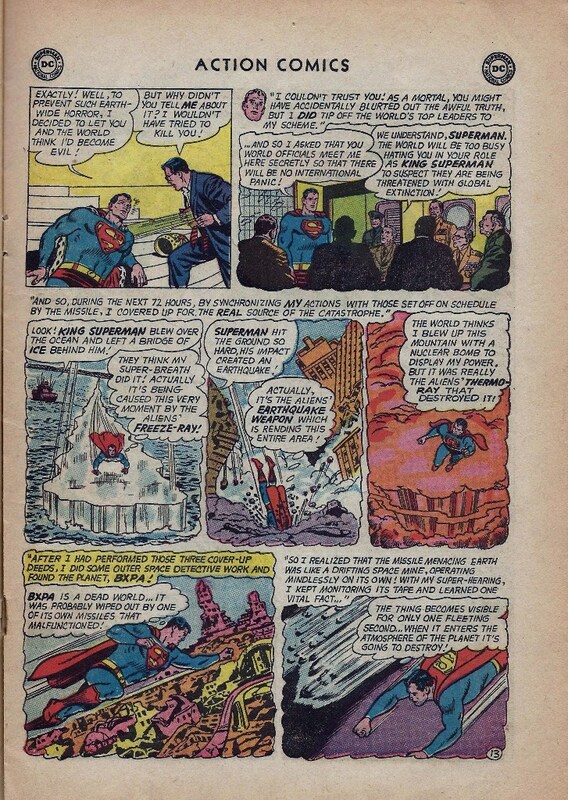 If Superman knew the threat was coming then why do all of this nonsense of becoming King of the Earth to avoid telling the truth and starting a so-called panic? Strike "Truth" from Trusth, Justice, and The American Way. He could have used the time he wasted ORGANIZING THE JUSTICE LEAGUE OF AMERICA to stop the impending doom. Did he do that? No! He made statues of himself and chased Clark around like a total dope. 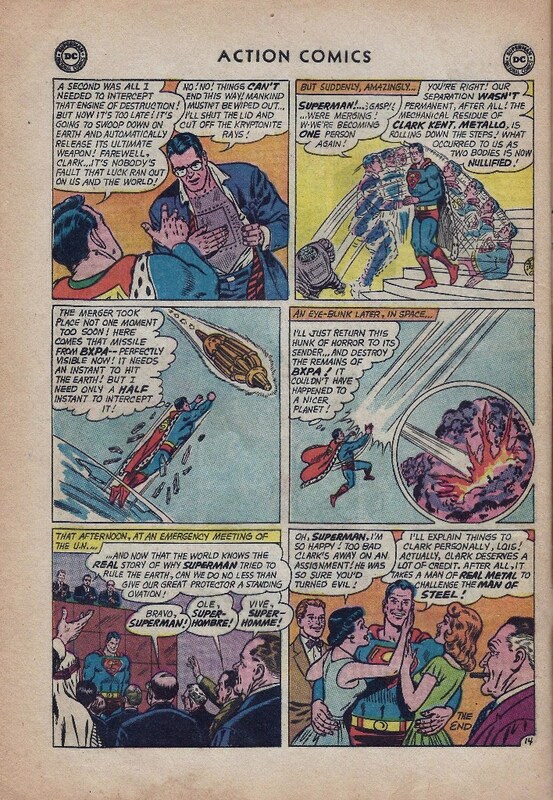 I would be pissed if I knew Superman was dicking around while a weapon of mass destruction was on its way to destroy everything. Thanks, Superman. Then again, this is a Superman that was developed from the mindless blob of stupidity we call Clark Kent. Remember folks, it was Kent who decided to have his ENTIRE BODY from the head down replaced in a questionable surgical facility (Hi, Doctor Nick!) after being shot by a small-caliber bullet. Stupid + Stupid = Stupid. Kav: I'm still speechless from the last page Tony-you better handle this one. Hold all calls. Kav: AAAAAAAAaaaaaaaaaaaaaaaaaaaaaaaaaaaaahhhh!!!!!!!!!! Clark's head somehow magically reconstitutes his chopped-off body and merges with Superman!!!!!!!!!!!!! WTF??? What happened to the body back in Atlantis, then? Did it 'disappear' at the same exact time? This would really frighten Einstein, Podolski and Rosen! Apparently quantum mechanics means NOTHING to the DC writers. PS I think stupes should have kept the leopard skin trim on his cape, man. Tony: I had a feeling it would be one of those six panel lets-wrap-it-up-quickly pages. 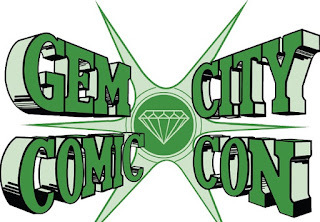 This was awful and we've reviewed some awful Superman comics. 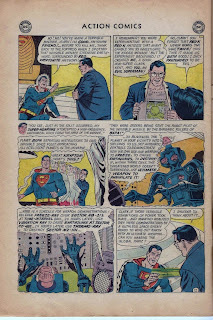 So Clark's head melds with "Evil" Superman's body? 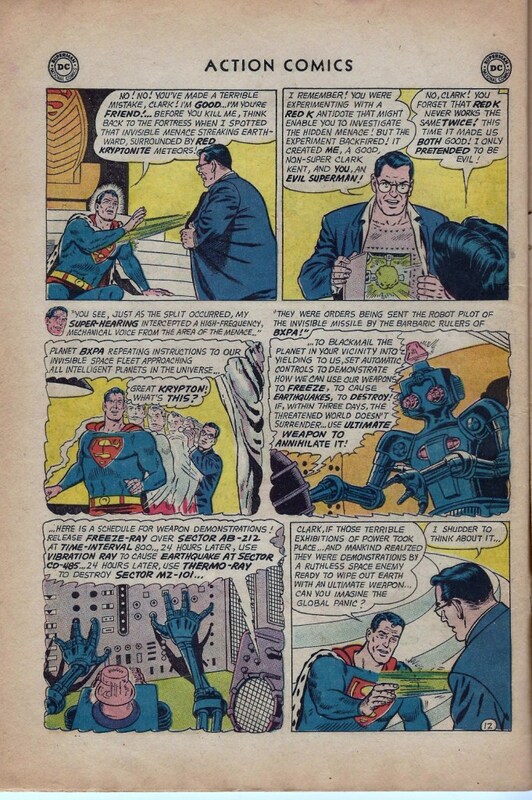 The Metallo version of Clark's body does not meld, but what happens to the head of "Evil" Superman? It would have been cool if the head was kept in a freezer with Walt Disney's head and Ted Williams' head. Now that's a TV show, folks. Of course the meld happened just in time. Of course Superman stopped the weapon of mass destruction. Of course stupidity prevails. Yay! We ended this issue but not the series. Kav said he's got a piece of dung disguised as a Jimmy Olsen comic book for us to review. Joy!